Now that we have returned from our outing to Silent Lake I wanted to take this chance to post a note. Roxanne and I spent 3 quiet days at Silent Lake provincial park in eastern Ontario. Trip dates were Feb, 15, 16, and 17th. I spent most of my time playing radio, while Roxanne read a few novels. We also enjoyed the outdoors, WX was mostly overcast with a few sunny windows, but not too cold. The previous post has some of my planning information and may be of interest. The truck was unpacked into the snow transportation for the final trip to the camp. The Yurt is a 14ft circular "insulated" canvas temporary winter shelter and is equipped with a BBQ! The entire space is very basic but comfortable for the duration planned. Cooking is done outside, on the Coleman and Propane BBQ. Heating is with a small wood burning stove. There is no electricity and very very poor cell coverage. All the wood you could ever need is provided at the edge of the site and it is replenished every morning. Most need a final splitting to make into reasonable pieces for the stove. The wood used by the 6 Yurts in the campground is taken from the park its self on a yearly basis. The 6 available Yurts book up very quickly and are in high demand, planning ahead and taking what you can get is simply a must. Well,... Salmon on day 1, Steak on Day 2, suppers were very yummy. Silent Lake is a multi use park which sees several users involved in activities such as ice fishing, snowshoeing, and skiing. I suspected the only way I could reliably get on 80m in a park with limited open spaces would involve a end fed random wire antenna. A few days before we left I ordered an ICOM AH-4 tuner form Radio World. A quick trip to Princess Auto and I picked up 100ft of 12AWG wire for the long wire, and 200ft of 14AWG wire to make 4 50ft radials. I chose the AH-4 simply because it works with the 1 button push tuning on the face of the IC7000, successful tuning results in the "tune" indicator being displayed. It is as simple as that. I was pleased with the workmanship of the AH-4. The 4 radials at the ground. The random wire end fed solution proved very effective as I received reports of S9+10 to S9+15 on the 100W pk of the IC7K. All bands were 1.5:1 or better (where I tried them) with the exception of the CW portion of 80m. 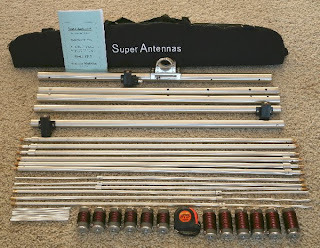 The portable Yagi, is the Super Antenna YP-3. Setup was very easy and I had pre verified the needed element lengths for the the CW portion of 20m. Although this kit can accommodate 20m and above I only used the YP-3 on 20m this trip. The boom parts snap together and elements are easily assembled although chilly on the fingers. At 20m the elements are loaded and the beam width is about 18ft wide. Total height is approximately 20ft if fully extended. I was not able to go to this height because of tree limbs which were near by. A simple table in the yurt serves as both the supper table and operating position. Battery plant, was 4 gel cells, 200AH, after 3 days of operating, 30% capacity remained in the batteries. Equipment included, Signal link USB, 12V Laptop "inverter", Battery Booster, CAT converter, Laptop, IC7000 and mic. On Tuesday evening I knew the gang was at the MARG meeting and Norm NLH was not available, so after I checked into the Sandbox net I gathered enough steam to try 3730 Net Control. Thanks to every one who checked on to 3730, I had a blast! It was so nice to be able to hear everyone! Most DX QSOs were to Europe, although I was also able to contact a few stations in South and Central America. 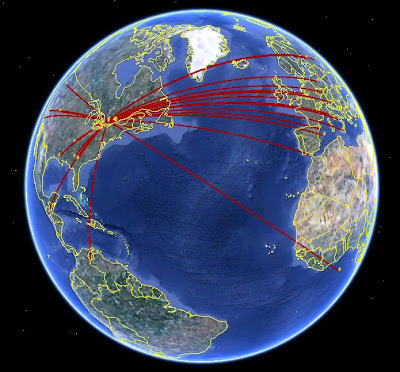 Many US stations and fellow Canadian operators were kind enough to return my calls as well. Most QSOs were 40m and 20m PSK. I did check into 3730, Sandbox and Ontars on occasion. Wednesday morning 7:00 Eastern, I tried my best to work Tx4T Hamradio DX-Pedition to French Polynesia but with no success. We took a hike around the lake, and stopped for tea on the way back. It clearly would have been a bit nicer if it had been sunny. Thanks for dropping by to the blog. Nicely done Adrien, well documented and you had a great time playing ham radio in the Canadian wilderness. You should post more - you have some excellent material here. Thanks for the kind comments Bob. I relly enjoy the field operation part of the hobby. Thanks for the great article. I have the 7000 and was looking for info on the ah-4. How do you like the YP-3? Silent Lake Yurt "DX expedition"